I absolutely agree we should back this up with some solid documentation. It is a more advanced feature that has great potential and it would be nice if everyone who wanted to could take advantage of it. 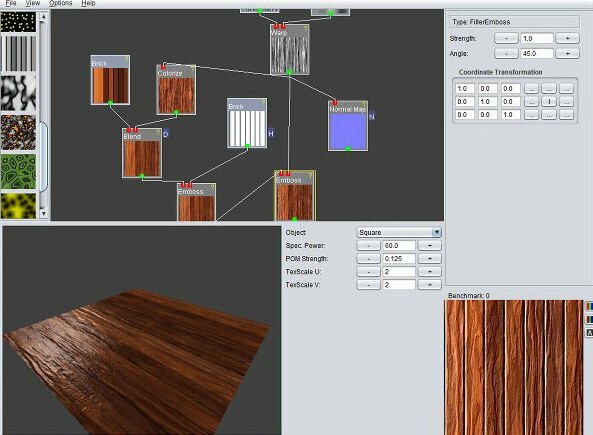 While I applaud the inclusion of a live non-destructive procedural texture filter, asking your users to write mathematical formulas "sort-of" hampers creativity and texture exploration while designing. It's not a very conductive approach to quick experimentation, and the way controls are implemented is kinda clunky as well. I remember asking the Photoshop devs to integrate some kind of procedural texture generator, and they never did (aside from the terrible uncontrollable clouds filter and a few simple noise generators). Filter Forge uses a nodal system. This is, in my opinion, the most flexible and usable visual approach, although perhaps not the most intuitive one for designers. 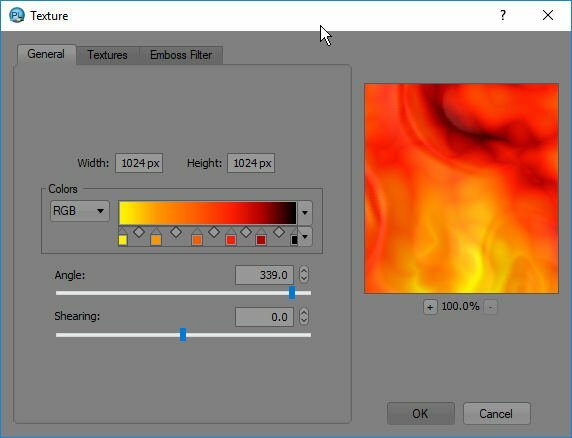 PhotoLine uses a more traditional dialog approach, and applies these as a texture fill with full visual control over placement with a nice fill widget to control transformation. The advantage of having these as a regular fill option is that procedural textures also become available in layer effects, for example. Substance Designer does a quite nice job making this rather intuitive and relatively easy to use (in my opinion). 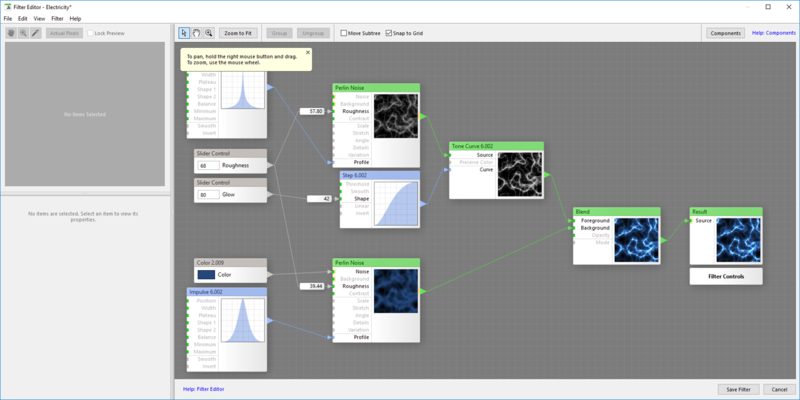 I would love to see Affinity's procedural texture filter to have simple node-based controls. 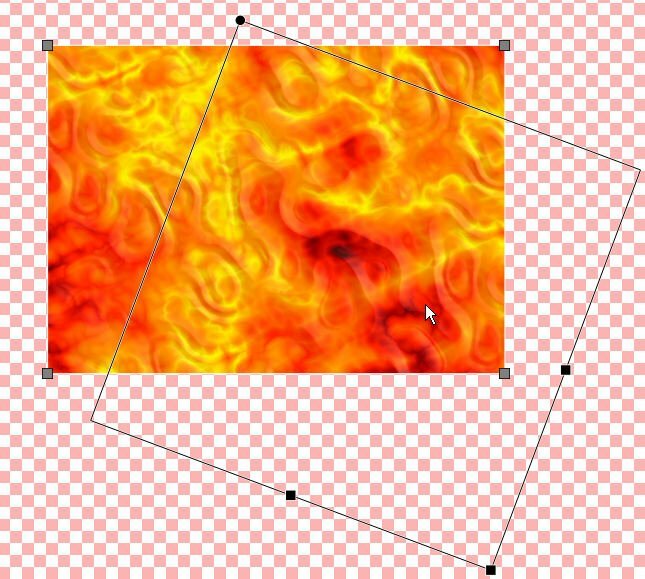 I really think it is the best way to go, in combination with the level of control that PhotoLine has to control these textures with an on-canvas control widget. Perhaps separate the colour controls from the texture controls as well? Not sure. And allow the procedural textures to be used as a Fill too. The Affinity dev team probably wanted to get something working, and might be expecting the community to come up with new presets. Which is a half-way solution in my opinion. I regularly open FilterForges node editor to make some additions and adjustments to existing filters, and I expect that presets will only satisfy a subset of user cases. As its stands, you can't really expect the average designer to dive into math to experiment visually with the new procedural texture filter. It's not very intuitive or open to visual experimentation in its current state, and is in dire need of GUI exposure. Even G'MIC's procedural patters expose all the controls and only provide a list of pre-made patterns, and I think that is preferable, with its built-in limits in regards to presets, to a math editor. To cut a long story short, I hope the Affinity devs will be exposing the internal math to some kind of GUI controls, without the need for typing math expressions, and to open this up for quick visual experimentation and creative control. Because its creative potential is there. Thanks for the suggestions. I have to agree with some of what you have said. I don't know what direction we plan on taking this feature but I can pass the feedback on for you. I'll also move this thread to feature requests so other users can add their input. First: Thanks for this very useful tool. 1. Yup, an advanced documentation with explaining equations is needed. 2. No way to save a preset for the bottom (variable/modifyer) part, even when add a new variable. 3. The "filter" just works to areas where content is, not on "blind" areas. Thats often great and wanted, but sometimes i just want a "canvas all" behaivior, so a switch how its working would be great. 4. If i save presets the blendmode and opacity should be part of this. But with the option to disable this, by switching presets. 5. the equation it self is hard to see. Would be great if i mouse-in a bigger, better readable float would appear for writing my eqaution. 6. For the variables 0,1 /1.1.... would be great to set multiply-factor direct here, instead as complex part of the main-equation. (Example: i want a range from minus 0.25 to plus 0.75 so i just hit in this factor-filed *0.5+0.25. It would be also great if a slider... can booth. The precise step-fore/back and the fast fader-behavior. So clicking an fader AND the left/right keys just increase by one step. or holding shift slows down the slider... (BTW: should be general behavior of ALL sliders). Designers are used to sliders and selection lists. You you make node based interface users have to study some..
FWIW, the window can be dragged open much wider than the default so that all or most of even very long equations can be seen without scrolling the cursor. The widow size is not 'sticky' so you have to do this each time you want to see longer equations, but it is better than nothing. For now, an inelegant but workable alternative is to use TextEdit via copy & paste for writing new or modifying existing equations, but hopefully later betas will give us better ways to work with equations. Frankly, for most designers I think creating complex procedural textures will always require a certain amount of study, regardless of the approach used in the app, & different designers will likely prefer different ones for different reasons. Long lists of methods & lots of sliders would probably seem too cumbersome & restrictive to some. Some probably also would find a node-based visual approach too cumbersome, & some would most likely consider an unrestricted math-based approach to be the only "pro" choice. Personally, all I really want to see at this early stage of development of this feature is enough documentation to know what the heck all those terms in the built-in presets can do. Until we have at least that much, I doubt there will be any hope of reaching a consensus about the best way to implement it in the UI. Personally, I would just drag and flip sliders and switches at random to see what happens and I really do not consider this "pro" approach. Except, also for other many professional designers this would be the way they would use texture creation tools. Ok, please give me an example how i can see the 3 "equations" bigger. (not in this retina-Screenschot, which is big enough, i mean the real 0.25 solution..... without going to apple-preference and set another display-mode? Tell me, why there is a "scroll-filed in the bottom/modify part= I HAD this window set to big-enough/position to a place i liked IN THIS SITUATION... but worked at another layer and swicthced back... The postition/window-size was NOT sticky/remebered/big enough... yeah, same for ALL filters when switch back, since version 10004.... or whatever... this is NASTY!!!!! Whats your motor? I want the most smart, fast, direct... way: I love Serif AND The LOVE is my motor for being "nasty"!!!!! ---- You seems ALWAYS to say "nope, is not necessary, SERIF implemnets the best way, end of discussion!!!!!" Is Serif your country, your region, your familly, YOU???? And even if: If my country, my village, my family, even IIIIIIIIII.... would make REAL big mistakes... i would say "thank you, thats right, big mistake, i will do my best, for better future for ALL of us... its ok, do you except????". I think thats human. To "win" all games is anti-human! I have no idea why you think that. All I did was suggest a "better than nothing" workaround for the too-small window. I even mentioned that it was not sticky, implying that it would be a (minimal) improvement if it was. I also mentioned another inelegant workaround but that in no way means I think either one is a substitute for a better UI design. I do not consider us to be enemies but not infrequently I find it very difficult to understand what you are writing about, particularly when you enclose so much in scare quotes or break things up with so much unusual punctuation that I get lost trying to see how it all is supposed to fit together. Learning a few new tricks from time to time is a healthy thing I got used to nodes pretty quickly, and they are a better approach to solving many problems. They better describe the flow of information than stacked lists or layers and are also visually a lot more pleasing. I need to be honest, I got hooked on Fusion and do a lot of work in 3D apps. Most of them have such an elegant approach to complexity (including nodes, or other forms of procedural building tres), I have been wondering why the classic 2D content creation apps never adopted some of their tricks. 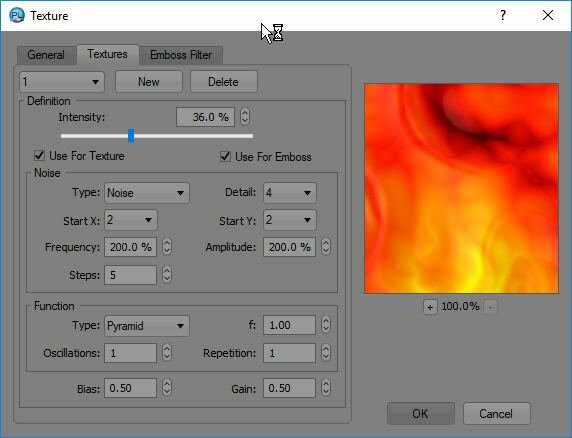 From what I can tell, the Affinity Photo beta Procedural Textures filter supports over 500 math functions, plus arbitrarily defined user variables & 6 custom input types. 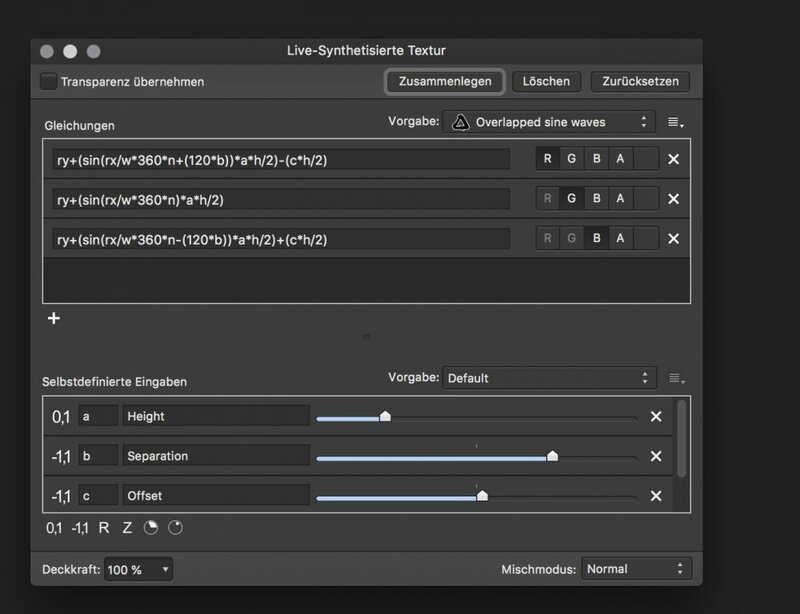 They also can include an unlimited number of equations and/or presets for custom inputs. Considering all that, I have to wonder if it is even feasible for a node based filter interface to offer as many capabilities in some other way that is significantly more approachable or more user friendly. 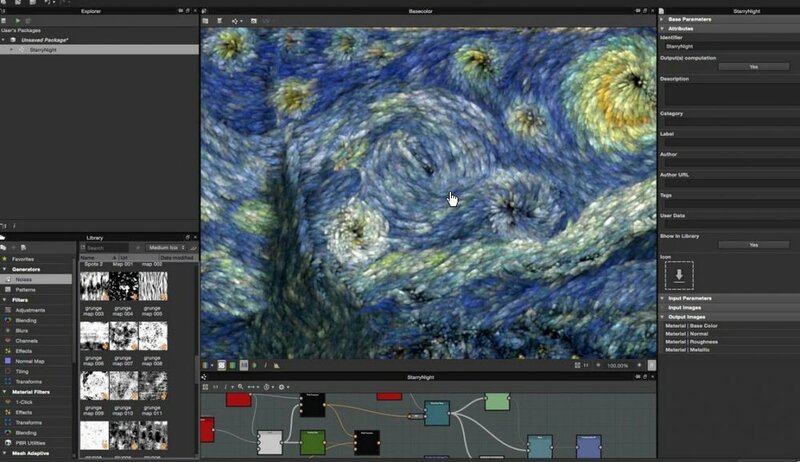 If nothing else, I can see how complex procedures could end up looking like a tangled nightmare of nodes & connectors that would be just about impossible to map into a coherent 2 or even 3 dimensional visual representation. Any thoughts on how to avoid that kind of problem? Wow! I think AP is going to need more than one approach. A GUI-based interface as described above as well as a good text editor and something like Visual Studio's Intellisense. And, as you mentioned, extensive docs. Wow﻿! I think AP is going to need more than one approach. A GUI-based interface as described above as well as a good text editor and something like Visual Studio's Intellisense. And, as you mentioned, extensive docs. That sounds like fun. I have been aware of procedural textures for some time, but I have only just read these threads. I have to say that I would much prefer a mathematically-based procedure than a visual, node-based one. I cannot find anything in the Windows help system. Is this only on Macs for now? EDIT: I have now found the help on this. I will try it out! I ﻿cannot find anything in the Windows help system. Is this only on Macs for now? What was it you were looking for? Intellisense is a feature of Visual Studio, Microsoft's software development studio neither of which is part of Windows. If you're interested, Visual Studio is available in a free Community Edition which is almost identical to the licensed Pro version. I was frightened by an equation as a small child and have, sadly, never recovered. Not me, but I am old enough to have forgotten the basics of math beyond arithmetic. @casterle, I have misled you here. I meant the Photo 1.7 beta help system. Sometimes it feels like confessing to a terrible addiction in liking equations. Or liking a particular music genre. I was doing fine with equations ... until I started studying partial differential equations in college.